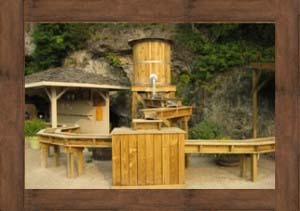 Installing a “Gemstone Mining Sluice” from Sandy Creek was a great addition to our Anthracite Mining Museum. Besides the revenue it generated, it created interest and excitement at this attraction. Sandy Creek has been a responsible supplier of our sand bags. They respond to our needs promptly and the “prospectors” are delighted with what they find. Thank you. We heard from our friends in the National Caves Association how successful a mining sluice could be. 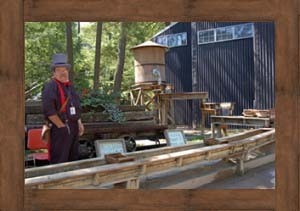 After attending an NCA Convention, seeing a sluice in action and visiting with Woody, we decided to have Sandy Creek design and build a mining sluice that would fit our attraction. Our sluice was completed in January 1999 and it only took 4 months for the profits to pay for the construction! The mining sluice is very popular with families and school groups, easy to maintain and has proven to be a great addition to our attraction. In fact it has been so successful for us, that in 2006, we decided to tear it down and build a sluice twice as big! 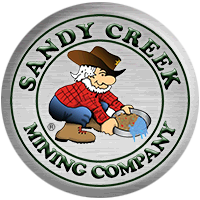 Sandy Creek has been easy to work with, promptly delivers all orders and continues to provide a great product for a good price. Sandy Creek Mining has been a great addition to our attraction. It's a big success and people of all ages enjoy panning for gemstones and fool's gold. I couldn't be happier with the prompt delivery service that they provide. 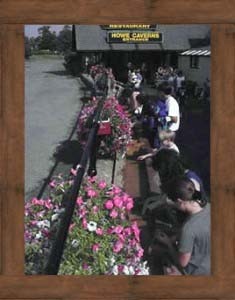 We installed our mining sluice at Howe Caverns in March of 1995. It turns out that gem stone mining has been the single biggest business addition we have ever made. Each year our mining operation has grown by more than 10% and now we sell about 100,000 pounds of mining rough each year. In 1998, we added a small indoor sluice in order to make mining a year round activity, and in 2000, we are adding another 30 foot sluice in a different location to accommodate “miners”. The entire Sandy Creek Crew has guided us in the right direction for more than 11 years. 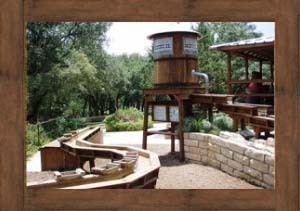 The Sluice has been a perfect fit for our attraction. Perry’s cave is located on South Bass Island in Northern Ohio. We got our first sluice in 1991 and replaced that with a bigger sluice shortly after that. In 2006, we added another sluice to keep the overcrowding to a minimum. This year, 2007, we had a 35% increase in our sand sales and have not had a price increase in two years. 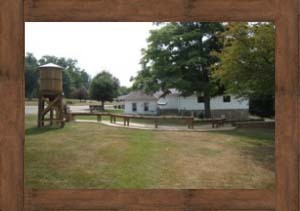 The Sandy Creek Mining operation gives us a great opportunity to entertain our visitors both young and old. Our school groups are able to use this activity to give their field trips an educational experience the kids enjoy and many of them come back with their families to share the fun with them. 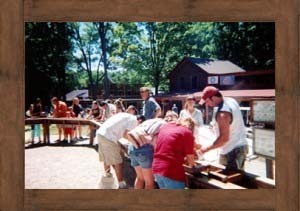 The unique aspect of getting to play in a water trough, look for gems, and starting a rock collection with the help of the information card makes this a family memory for years to come. Sandy Creek Mining Company is a service minded organization always giving prompt and accurate deliveries. This company also supplies us with many other rock related items like geodes, key chains, fossils, cathedrals, large crystal specimens, rock stands, agate slices, and many more at a cost to us equal or better than our other suppliers. Thank you Sandy Creek.